UNITED NATIONS — Members of civil society advocating nuclear disarmament are putting modernization programs under the spotlight ahead of a high-level U.N. conference this spring. The Count the Nuclear Weapons Money campaign will publicly hand-count $100 million per minute in fake $1 million bills in a weeklong performance to highlight the estimated $1 trillion that nine countries will spend over the next decade on modernization. For the U.S. alone, the Congressional Budget Office estimated last October that operating, incrementally upgrading and modernizing nuclear forces would cost $1.2 trillion for the period from 2017 to 2046. “Nobody has the idea of this quantity of money,” said Holger Gussefeld, who heads the project as special projects manager at the nongovernmental World Future Council, at a news conference here Wednesday. “People could do, the world could do, many, many other things, like helping to end climate change, ending extreme poverty and hunger, and working to protect biodiversity,” Gussefeld suggested. The Count the Nuclear Weapons Money project kicks off May 10 in New York and will take place alongside the U.N. Conference on Nuclear Disarmament, where U.N. member countries are expected to discuss “effective nuclear disarmament measures to achieve the total elimination of nuclear weapons” and a possible nuclear arms convention. Whether any nuclear countries will attend the high-level conference remains unclear, and an organizational meeting to decide the agenda and appoint conference chairs has been postponed until May 10 — just four days before the meeting is set to start. 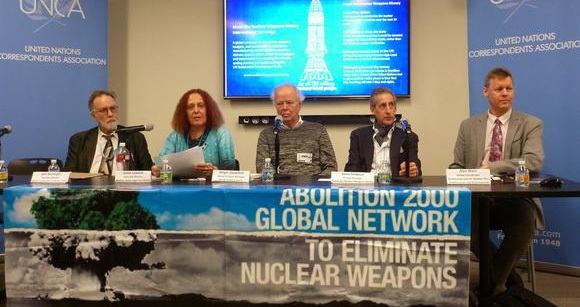 “One of the things I think we’re here to say is that this opportunity should be seized upon by the nuclear powers which are confronting each other now in a very, very dangerous way that threatens all of us,” Cabasso told reporters here Wednesday. “This high-level conference could provide support and encouragement,” she said, as it could come between a planned summit between the two Koreas in April and a U.S.-North Korea summit in May.